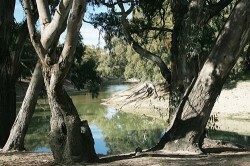 Being on the Darling River again has rekindled the desire we had in 2011 – to follow the Darling. We went as far as we could, but had to choose another route, due to flooding, so we are now able to see the next few stations along the river. 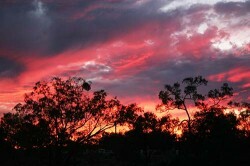 We left Bindara and travelled towards Menindee Lakes. On arrival to Kinchega National Park, we went to the Ranger’s headquarters, where there is an enormous shearing shed. This area offers accommodation for up to 40 people, with fresh water and showers. We then took the River Drive, which meanders for about 20 kilometres through the red gum woodlands on the banks of the Darling River. 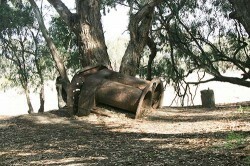 Further along the Homestead Loop is the boiler of the Paddle Steamer Providence. It exploded, killing all the crew in 1872. The boiler was winched out of the river when it became a navigational hazard. We had lunch at a picnic spot at one of the 35 camp sites along the way. 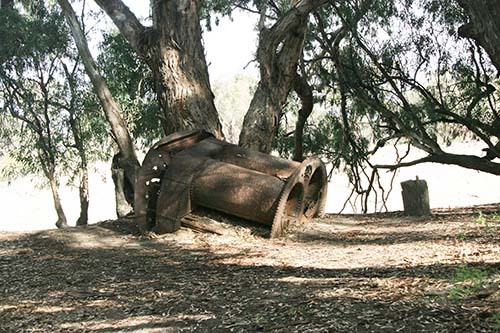 Stopped at Menindee to collect a few supplies, but with only a small grocer, we were a bit limited. 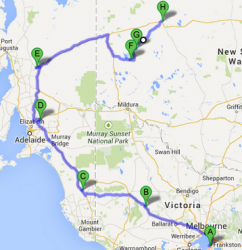 Continued to Wilcannia, where we booked in for three nights at Warrawong Station. We were a little disappointed, as they have set this up too well! Too much like a caravan park, but lovely facilities, a communal fire and camp kitchen. It is situated on a beautiful billabong, with pelicans, swans, ducks and loads of birds. The first day we saw a pair of red-tailed cockatoos in a Shea oak. There are not many shops in town – a ‘friendly grocer’, pub, post office, petrol station and restaurant. The diesel is 179 cents per litre and orange juice, $8 for 2 litres! Yesterday, we had lunch at the Chinese restaurant at the Golf Club – massive meals – half of which we had to leave. Reasonably priced. The sunset on the first night was beautiful. 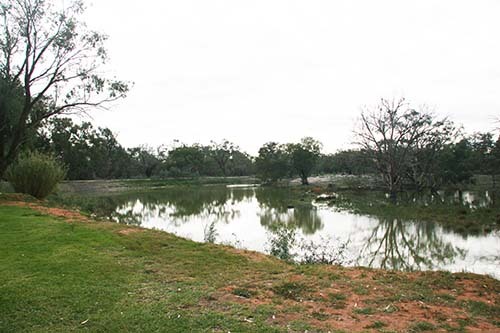 Today, we went for a walk to the other side of the billabong, where we spotted a fireplace, so returned to camp and prepared a lunch to BBQ at this beautiful little spot. It is 21 degrees, after quite a mild 10 degrees overnight. Tomorrow we are heading towards Bourke along the eastern side of the Darling, stopping at a station along the way and visiting the Paroo Darling National Park. We may not have 3G as we travel between Wilcannia and Bourke, so it may be a while before our next blog.